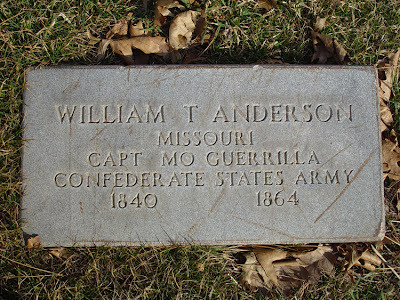 The Civil War was a brutal and savage conflict, but try as I might, I can't think of anyone as bloodthirsty as William T. "Bloody Bill" Anderson. Born about 1839 in Kentucky, the family early moved to Missouri, where William grew up near the town of Huntsville in Randolph County. In 1857, the family moved to Kansas and William worked for a time escorting wagons along the Santa Fe Trail. Kansas and Missouri were considered the limits of civilization and the border region was open for all manner of lawlessness individuals. For years before the war, a proxy conflict had been waged in Kansas and parts of Missouri over the issue of slavery in the Kansas Territory. 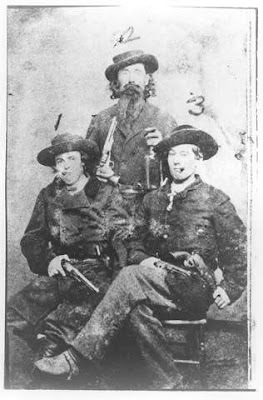 Pro-slavery guerrillas (primarily from Missouri) were known as "Bushwackers" and anti-slavery guerrillas (primarily from Kansas) were known as "Jayhawkers." 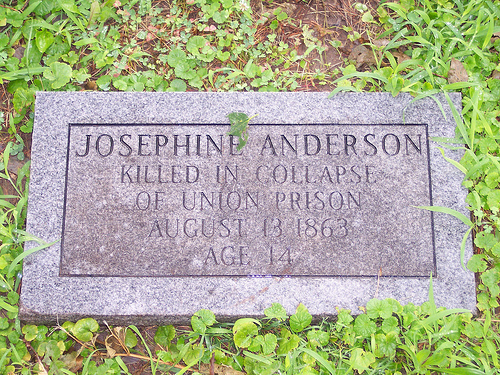 Pro-Union supporters often harassed pro-Southern families and in March of 1862, Anderson's father was accused of horse thievery during an argument was shot dead by a local judge. William and his brother later confronted the judge and shot him dead. Following this incident, the family left Kansas relocated to Missouri. 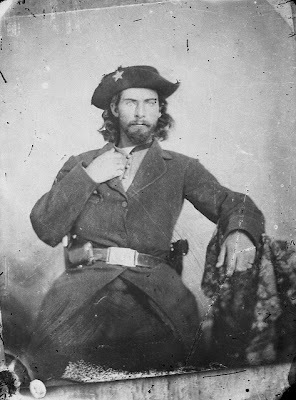 When the Civil War broke out, many of these Jawhawkers enlisted with the Union Army, however because of the weaker organization of the Confederates in Missouri, many of the Bushwackers became Partisan Rangers and operated in favor of the Confederate cause, but under their own command. 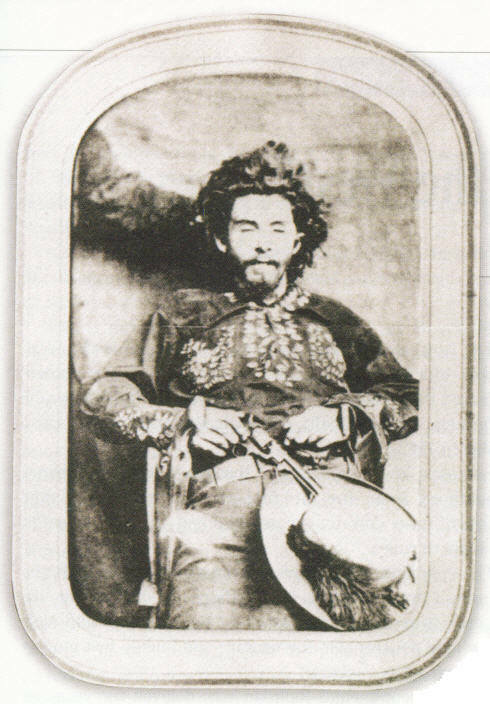 Anderson joined up with William C. Quantrill's guerilla outfit. Hatred ran deep on both sides. 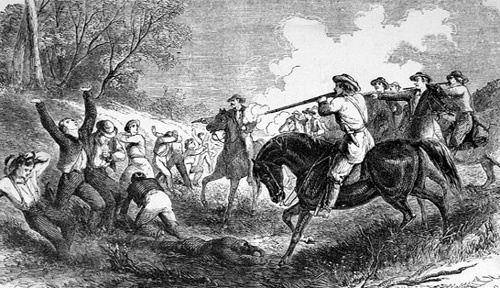 Jayhawkers would kill and loot in Missouri and Bushwackers would retaliate in kind. 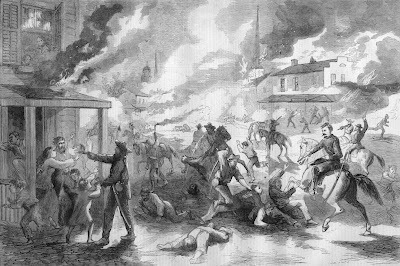 Events quickly spiraled out of control to the point where US Senator James Lane led a force of about 1,200 drunken soldiers in the burning, looting, and indiscriminate killings in Osceola, Missouri. 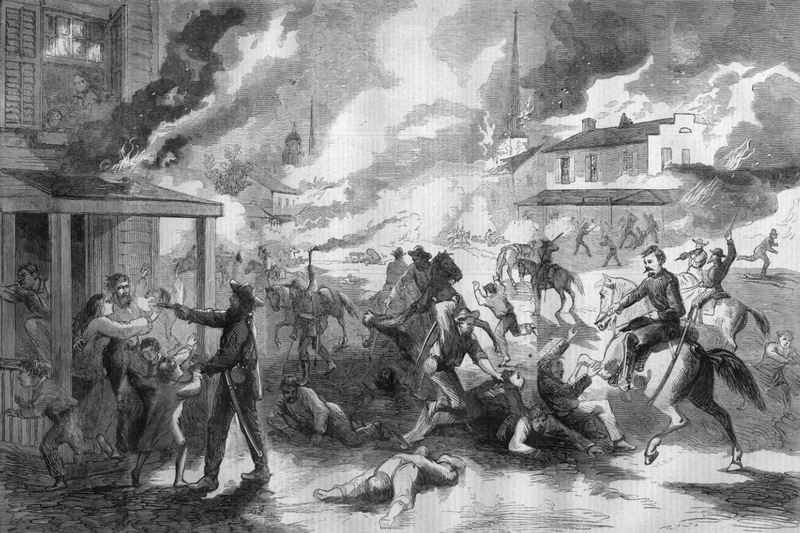 In retaliation, Quantrill's men skirmished with Union forces from Kansas, raided pro-Union towns, and robed mail coaches. 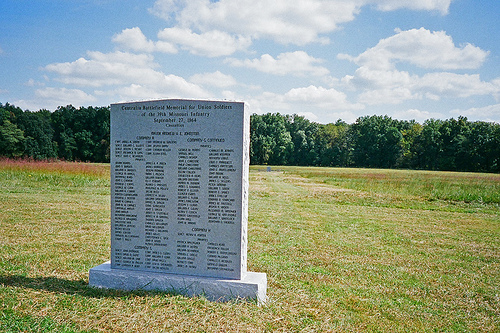 At first, Quantrill operated under clear guidelines of war, but when the Union Army began executing Quantrill's captured men, Quantrill started ordering the execution of captured Federal soldiers. 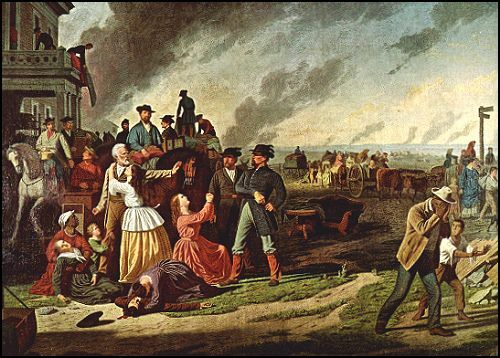 Enraged at the return executions of Union prisoners, General Thomas Ewing, Jr., ordered the arrest of women in the families of known Confederate Partisans or other women suspected of providing food or medicine to rebel soldiers. 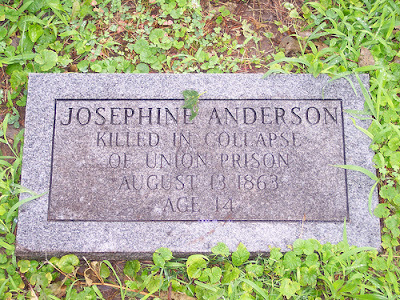 Among the women taken by the Union Army were three of Anderson's sisters: Mary, Josephine, and Martha. The women were imprisoned in the three-story Longhorn Store and Tavern in Kansas City, Missouri. In order to accommodate their large number of prisoners, the Federal soldiers removed supporting beams in the lower floors. Unsurprisingly, the building collapsed, killing four of the women and injuring many more. One of those killed was William's 14 year-old sister Josephine and his sister Mary was crippled by having both her legs broken. Two other women who perished were cousins of Cole Younger (who would later ride with Jesse James). 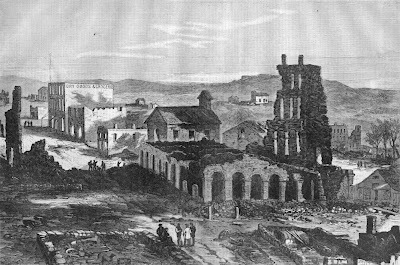 Four days after the collapse of the jail, General Ewing issued his General Order Number 10, expelling families with known Southern sympathies from their homes, those homes to be burnt, and women and children to be sent south. When word of the killings and forced expulsion order reached Quantrill's men, it enraged them to the point that they no longer cared about their lives, only retribution. 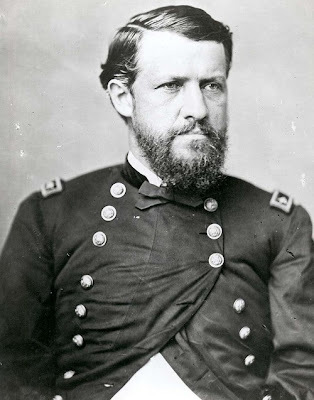 Quantrill, with his lieutenant William T. Anderson, hatched a plan to attack the Jayhawker stronghold of Lawrence, Kansas (Lawrence was also the home of Senator Lane who had led lead the earlier attack on Osceola). Quantrill called upon various leaders of independent Bushwacker outfits (many of whom rode over 24 hours straight lashed to their saddles in order to rendezvous with Quantrill) to join him in the raid against Lawrence. Just before dawn on August 21, 1863, somewhere between three and four hundred Bushwackers led by Quantrill converged on the town of Lawrence. Each of the men was armed with multiple revolvers stuffed into their shirts so they wouldn't have to reload. The raiders set fire to the town and for four hours went house to house killing every able bodied man they could find. For his part, Senator Lane escaped death by fleeing through a cornfield in his nightshirt. In the end, just shy of 200 men were killed by Quantrill's men that day. 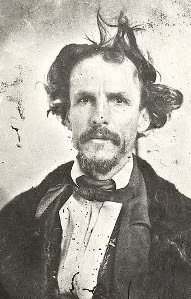 The Bushwackers broke into smaller units with many of Quantrill's men including William Anderson heading down to North Texas. Four days after the attack, General Ewing issued his infamous General Order Number 11, which ordered for the forced expulsion of everyone (regardless of their allegiance) in the Bates, Cass, Jackson, and Vernon Counties of Missouri. All homes were to be burned and widespread looting by the military ensued. While in Texas, Anderson fell for and married Bush Smith. 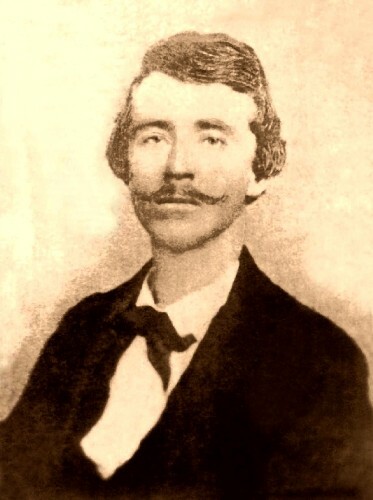 Quantrill disapproved of Anderson's marriage and the two parted ways, with Anderson becoming the leader of his own company of Partisans that then returned to Missouri in the Spring of 1864. During this time, Jesse James joined his brother Frank who was already riding with Anderson. "I commenced at the first of this war to fight for my country, not to steal from it. I have chosen guerrilla warfare to revenge myself for wrings that could not honorably avenged otherwise. I lived in Kansas when the war commenced. Because I would not fight the people of Missouri, my native state, the Yankees sought my life, but failed to get me. Revenged themselves by murdering my father, destroying all my property, and have since that time murdered one of my sisters and kept the other two in jail twelve months." Anderson earned the nickname "Bloody Bill" about this time in reference to the increasingly barbaric practices of Anderson's company. Federal soldiers and Unionists were always killed when captured and their bodies were frequently mutilated by decapitation, scalping, or castration. Scalps were hung from their bridles and it is said that William kept a silk cord in which he tied a knot for every Yankee he killed. On the morning of September 27, 1864, with about 80 men dressed in Union uniforms Anderson rode into Centralia, Missouri and blocked the rail line. The train was stopped and 23 of the 125 passengers were found to be Union soldiers going home on leave. The soldiers were ordered to strip off their uniforms and Anderson asked if there was an officer among them. Sergeant Thomas Goodman, expecting to be killed for the others, lied and said that he was an officer. 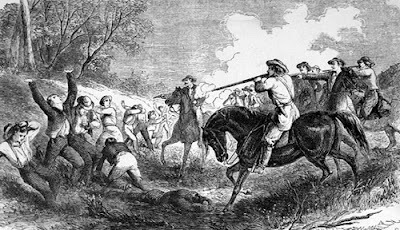 Anderson's men then took Goodman prisoner and killed the rest of them and then mutilated their bodies (Anderson's plan was to exchange Goodman for one of his men who was being held prisoner, but Goodman escaped after ten days). Anderson's men then set fire to the train and sent it down the tracks. The commotion attracted 155 men of the Union's 39th Missouri Mounted Infantry armed with Enfield rifles. They formed a line and called out Anderson's men. Anderson charged with pistols and he and his men killed 123 of them in the ensuing battle. When word of Centralia reached the Union command, they tasked Col. Samuel P. Cox with eliminating Anderson. Cox with about soldiers tracked Anderson's men to Albany, Ray County, Missouri, and on October 26, 1864, lured him into an ambush with a detachment of cavalrymen. 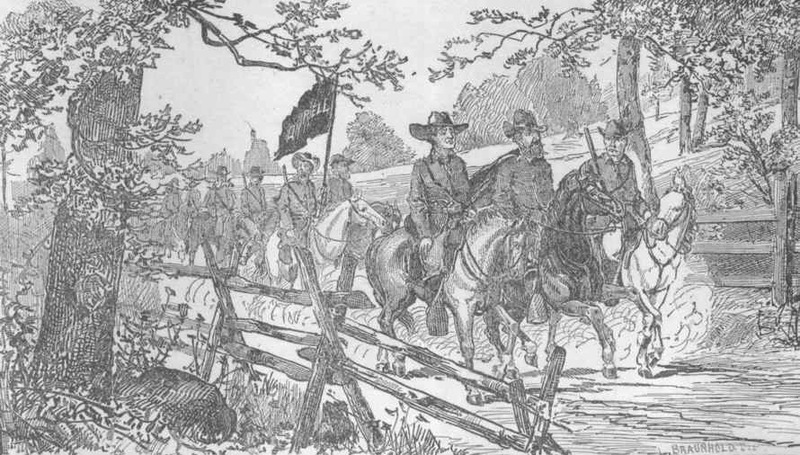 Coming across a strong line of dismounted cavalrymen most of Anderson's men turned attempted a getaway. Anderson rode through the line unhurt with Archie Clement, but turned around when he noticed young Clell Miller had had been wounded. When he returned to attempt to rescue Miller, Anderson was himself felled. The bridle of his horse contained numerous scalps and among the his possessions was a silk cord with 53 knots. His remains were taken to Richmond, Missouri, where the body was posed with a pistol and photographed. He was then decapitated and his head was placed on a telegraph pole outside town while the rest of his body was dragged through the streets. After the fall of the Confederacy, Anderson's men would continue their banditry. 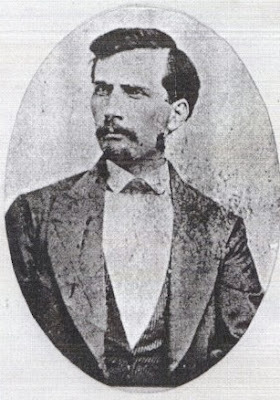 After several bank robberies, Jesse James was at the Daviess County Savings Association in Gallatin, Missouri, in December 1869, asking the cashier to change a $100 bill when Frank walked in, pulled Jesse aside, and pointed out that the cashier resembled Samuel Cox (the man who killed Anderson). The two immediately turned their guns on the cashier and shot him dead. The cashier was not Samuel Cox, but rather an innocent John Sheets. Well, that was a grusome story. But, I read the whole thing. Judi, thanks for checking in. I'm glad you're home safe. It was fun to keep up with your travels on your blog. I was a little disappointed when you and Rollie turned north in New Mexico. I thought you might pay us a visit here in California. You know we have nice RV campgrounds not too far from us in Pismo Beach and you would have missed all that nasty weather. Don't know what to say about the Live Feed thing. I've noticed it's not perfect though. Interesting story. I kept looking for the name Josie Wales, but, alas, it was not to be. %^) I understand why there is still resentment on both sides, today. It was a nasty war (as if there was another kind). In my genealogic work, I've found that most of "my people" were still in Scotland, Ireland, or Germany when the Civil War was going on, but, one branch ranged from New York, through Indiana and Kentucky to Missouri. Can't find any mention of affiliation. Mathan, that's funny, I almost included Josey Wales. A few years ago another very good film, "Ride with the Devil," was made that also centered on this time period. Did you see that one? Holy smokes! The senator's hair is amazing. The 1st time I heard of Quantrill was in True Grit. "Ride with the Devil"? Nope. Not familiar with that. I spend most of my 'historical input' in Scotland, south-central Montana or wherever I'm living at the time. I do a bit of genealogy and was very interested in "The Bloody Bozeman" (book), "Heaven's Gate" (movie), and stories told by my aunt (grandfather moved from Scotland to Montana in 1906). I was amazed that a mere 20 years separated each of those three 'events'. I'm now working on "Cities of Gold" about the Conquest by Coronado. Maybelline, I also thought Senator Lane's hair was great! I can't imagine any of our politicians today allowing a photo like that to become public, but I still have to think, what was the photographer thinking when he took the photo? Well put together! I did not know such a monument was erected for the Centralia. I can't find anything on the two men who posed with Archie Clement in the only photo I could find: Dave Poole and Bill Hendricks. Leila, thanks for the comment. 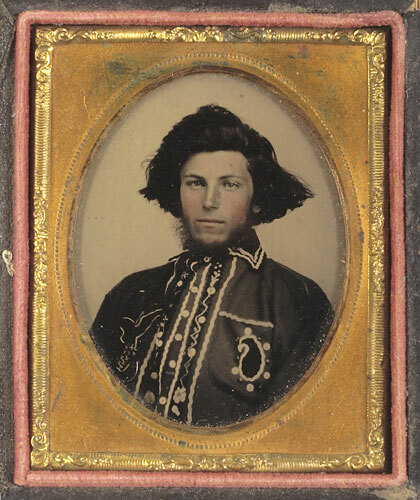 I don't know much about Hendricks, but Captain Dave Pool (sometimes spelled Poole) took command of various men when Anderson and later Captain Todd (another of Quantrill's men) were killed. He surrendered his 65 men to Colonel Harding at Lexington, Missouri on May 21, 1865. Pool was given a full pardon and later settled in Sherman, Texas, where the photo shown here was taken. Excellent post !! What blog platform do you use on your www ? Any idea when/where that was from? I was always fascinated about the American Civil War and the whole bushwhacking part is particularly interesting as it presents our future western cowboys Jesse and Frank James, as well as many more, who then became legends everywhere in America. Even as aggressive militiamen, they may have been terrorists for the Union, but were definitively patriots and heroes of the South. I also find it disappointing that this union leader, Senator Lane, was able to escape from the town of Lawrence through a corn field during the "Lawrence Massacre". If anything he should have been dead and not those hundreds of other Kansas men. We shall conclude that revenge is part of honour and when talking about honour and warfare, innocents get hurt in the process. But on the other hand, no man is truly innocent. Please take a look at the 3rd picture from above. In my opinion, this gentleman could not have been BB Anderson - because of his receding hairline. The famous picture of the dead Anderson shows a skull with very full hair, but that's not the case with the gentlemanly looking gent on the 3rd picture from above. I see your blog regularly. Your blog is very useful for us. Do You Need pest control services in Enfield EN1? We have over 10 years experience, Emergency 24 hr Pest Control in Enfield EN1 are focused on providing a professional, quality and reliable emergency “pest control” service across London and the home counties.